More weird scheduling: The series was already slated to be Thursday, Friday, and Saturday due to Easter Sunday. But during Thursday’s win, ECU announced there would be no game on Friday because of poor weather that would turn out to be severe thunderstorm and tornado warnings. Instead, the teams played a doubleheader on Saturday. The first game began at 9 a.m. and was only seven innings, due to an AAC rule that when a doubleheader is played on a team’s travel day, one must be seven innings while the other is a full nine-inning game. Unsurprisingly, ECU’s upcoming home game against UNCW on Tuesday is a game that was rescheduled because of weather. Jake Agnos is an ace: Agnos absolutely dominated a matchup of two lefty aces on Thursday night against UConn starter Mason Feole. The game drew about 30 pro scouts to witness it and Agnos more than won the matchup. Agnos went 8.2 innings and gave up just one run on a solo home run way back in the second inning. Agnos would have completed the perfect game but a missed strike call led to his only walk of the game with two outs in the ninth and his pitch count, 129 pitches, was simply too high to let him keep going. Agnos struck out a season-high 14 batters but topping double digits K’s is something Agnos does with ease. Spencer Brickhouse can really hit: Brickhouse likely earned himself some more AAC weekly recognition in the second game of Saturday’s doubleheader alone, when he launched two home runs and drove in five runs. Brickhouse hit those two home runs in back-to-back at-bats, the third time in his career he has done so. He now has 11 home runs on this season and 31 so far in his three-year ECU career. Another weekend, more AAC dominance: ECU is starting to sit very comfortably atop the conference standings. ECU has now swept UCF, USF, and UConn, and the only team it lost to, Houston, it took two out of three from. This weekend’s sweep puts ECU at 11-1 in AAC play and UConn, who was third coming in, drops back to 7-8 and to sixth place. Tulane is still next closest at 7-3 and in second place in the conference behind ECU, and they come to Clark-LeClair next weekend. ECU now has two-midweek games, a Tuesday home affair against UNCW at 6:30 p.m. and a Wednesday road trip to Old Dominion at 6 p.m.
Spencer Brickhouse hitting a home run. The first pitch of the at-bat was greeted by a hearty swing of the bat and the ball skyrocketed off the bat, right onto the practice football field past the right field fence. A prompt flip of the bat said what everyone already knew: this was a no-doubter home run. It was not the first time ECU first baseman Spencer Brickhouse had done this before, heck, not even the first time this game. Brickhouse (3-for-4) launched two home runs, drove in five runs and his display of power on Saturday led No. 12 ECU to a 9-7 win to easily take the second game of the doubleheader against No. 18 UConn. The win also led ECU (29-10, 11-1) to the series sweep of its AAC foe. It was certainly an improvement upon Brickhouse’s 0-for-2 showing in the first game of the doubleheader. Brickhouse grounded out in his first at-bat of the game in the first inning, the only time the Huskies would be able to retire him all game. His next at-bat in the third inning resulted in his first home run of the game, a three-run home run to erase ECU’s two-run deficit and make it a one-run lead. Brickhouse followed it up with the no-doubter two-run home run in the fifth inning that left Clark-LeClair Stadium. The home runs were Nos. 10 and 11 on the season, and 30 and 31 on his Pirate career. “I’m just glad he got some swings off. People pitch him so tough along with Packard and Burleson. They don’t get many pitches to hit like that, but when they get them normally they do damage. And he did damage,” ECU head coach Cliff Godwin said. Speaking of not the first time he’s done this before? It was the third time in Brickhouse’s career he homered in back-to-back at-bats. The junior has done it once every year of his career actually. He did so as a freshman in 2017 against College of Charleston and again last season against Cincinnati. “It comes down to going up there and trying to stay relaxed and trying to do damage to the ball. Me being a big guy, I feel like personally if I get singles it’s not going to do too much for the team. I try to drive in runs and what coach tried to beat into my head as a freshman is that I’m a run producer, so I need to go up there and fill that role,” Brickhouse said. Jake Washer and Chandler Jenkins each contributed solo home runs for the Pirates as well. And while ECU’s bullpen held UConn in check in game one, it struggled in game two. Burleson would go on to pitch 0.2 innings and Gavin Williams followed him with 2.0 scoreless innings. Ryder Giles struggled with the ninth inning, giving up only a leadoff home run before Zach Barnes came in and promptly gave up a two-run home run to cut the lead to two. 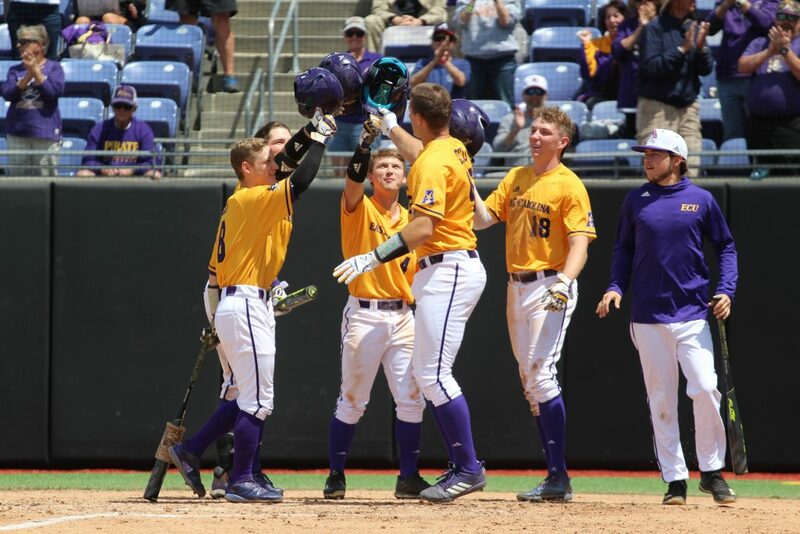 Barnes finally got the final hitter out (although on a hard line-drive to Packard in left field) and ECU escaped before it ever got too close. There was a seven-minute delay in the top of the first inning to see if a UConn batter was hit on the hand or the bat. Umpires discussed it for awhile first and eventually went to review it before making the decision that the batter was hit. Godwin was furious the hitter was granted first base and yelled at every umpire on the field on his way back to the dugout. ECU outfielder Bryant Packard was hit to open the bottom half of the inning. After that, things went largely similar to the first game of the day as UConn scored first again in the top of the third inning. The Huskies had runners at the corners and grounded to third baseman Nick Barber who threw over to Brady Lloyd but Lloyd made an error on the throw to first base and the run scored instead of an inning-ending double play. That proved doubly costly, as the runner was able to move to second when the throw skipped into the dugout. He scored as the next batter singled to center field to make it 2-0. Once again, ECU responded with three runs in the bottom half of the inning. Packard singled to lead off the inning, moved to second on a wild pitch and stole third base. Hoover walked and Brickhouse skied a home run to right field to make it 3-2. Washer followed that up with a slicing solo home run to right-center in the fourth inning to make it 4-2 ECU. UConn brought in closer Jacob Wallace, who has been great this season by only allowing one run in 23.0 innings pitched coming in, for the first time of the series. Wallace was met by a Washer double and a Lloyd bunt that Wallace threw away when trying to get Washer out at third base. Washer went in to score for an insurance run and Lloyd was granted second base after colliding with the UConn first baseman. Packard came through with a sacrifice fly to score Lloyd and give ECU a four-run cushion. Jenkins then pinch hit and launched his first home run of the season. It was an early start and a shortened game due to American Athletic Conference rules but the No. 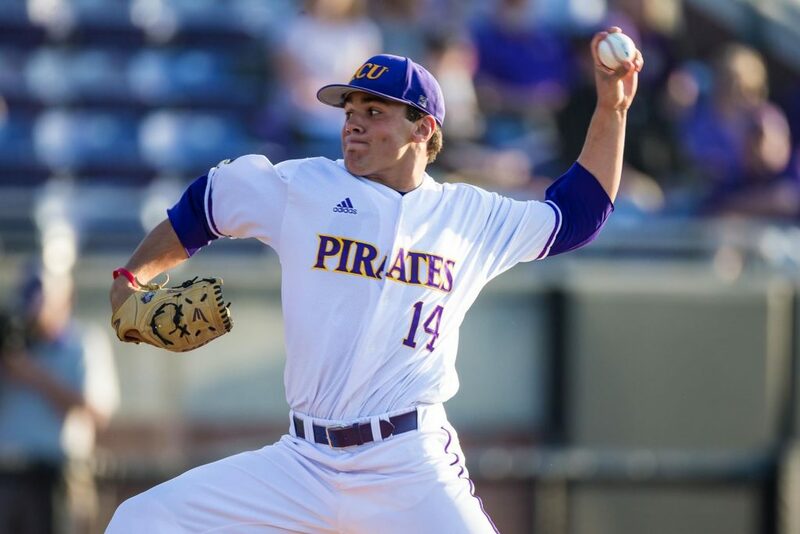 12 ECU Pirates continued to rack up conference series wins all the same. ECU (28-10, 10-1 AAC) took the first game of a Saturday doubleheader against No. 18 UConn by a score of 5-2. The Pirates take the series win in the process and improve to 10-1 in AAC play while dropping UConn to 7-7. The game began at 9 a.m. Saturday morning due to inclement weather in the area causing Friday’s game to be moved to Saturday. It was just a seven-inning game because AAC rules dictate that when a doubleheader is played on a travel day, one game has to be seven innings and the other a full nine-inning game. The difference in the game came out of the two bullpens. Both starting pitchers struggled, as ECU starter Jake Kuchmaner went just 2.0 innings and gave up two unearned runs. UConn starter Jimmy Wang went 2.1 innings and gave up three earned runs. ECU’s bullpen went 5.0 scoreless innings, while the Huskies bullpen went 4.2 innings and gave up two runs. Trey Benton, Sam Lanier, and Evan Voliva all went 1.2 innings each without allowing a run and Benton got the win (4-0) and Voliva got the save. Alec Burleson led the way for ECU, going 3-for-4 at the plate. He was the only hitter on either side who recorded more than one hit. There weren’t any big hits out of either team in the game, as the two teams combined for 12 hits, all singles. Neither team had anything on the board until the third inning. UConn scored first with two runs, one on a hit by pitch that scored a run and the other on a sac fly. ECU responded with three runs in the bottom half of the inning. Turner Brown and Lane Hoover both walked with the bases loaded to tie the game. Jake Washer then hit a sac fly to score the third run of the inning. Nick Barber and Bryant Packard added RBI singles in the sixth inning to make it 5-2. ECU has yet another schedule change thanks to incoming inclement weather, something that has become a norm this season. ECU and UConn will no longer play on Friday, a game originally scheduled for 6:30 p.m., ECU announced during Thursday nights 5-1 win. Instead, the Pirates will have a Saturday doubleheader with the first game starting at 9 a.m.
ECU Athletics announced that original single-day Saturday tickets would be valid for both games of the doubleheader. The first game will be a seven-inning game, which is required by the AAC for a travel day game in a doubleheader. The second game will be a full nine-inning game. It’s the third straight Saturday doubleheader for the Pirates. ECU had one against Houston two weeks ago and one against No. 1 UCLA last weekend. ECU also played two more doubleheader’s earlier in the season, a Friday on opening day against Radford and the following weekend on a Saturday against Monmouth. There was also the LeClair Classic, where ECU had a game suspended and finished the next day in a fashion similar to a doubleheader. ECU is 6-2 in doubleheader’s this season, undefeated before being swept at UCLA last weekend. In a game that drew 30 pro scouts for an elite duel between lefty pitchers, it seemed whoever won that matchup would likely win the game. So it was, as No. 12 ECU got a 5-1 series-opening win over No. 18 UConn Thursday Night behind the performance of Jake Agnos. He went 8.2 innings, allowed just one run and struck out 14 batters. Agnos logged 129 pitches while almost going the distance. “That’s the best (Agnos) ever pitched and I let him go into the ninth inning because of it,” “In a lot of his outings, he’s gotten stronger as the game’s gone on. He’s a competitor. He’s an adrenaline junkie, I think when he feels the crowd get behind him he can go back and get some extra,” ECU head coach Cliff Godwin told Hoist the Colours. He outdueled UConn starter and AAC Preseason pitcher-of-the-year Mason Feole. Feole was Agnos’ teammate on the USA Collegiate Baseball team over the summer, as well as Packard and Godwin was on the coaching staff. Agnos walked only one hitter all night but it is what kept him from a complete game. Agnos would have struck the last hitter out but a questionable call led to a walk and his pitch count was simply too high to continue. Agnos, putting it lightly, was not happy about Godwin pulling him out of the game and was heated. “It was immature on my part. I should have taken a deep breath and realized where I was at. I didn’t realize I was at 129 pitches. That was my fault. I was more upset about the strike call. I shouldn’t do that to Coach Godwin. He left me out there and allowed me to do that,” Agnos told Hoist the Colours. Agnos set a career-high for innings pitched. His 14 strikeouts were a career-high and the most by a Pirate pitcher since Jeff Hoffman in 2014. Agnos didn’t lose a beat all night, consistently hitting 92-93 miles per hour in the ninth inning and hitting 94 MPH on his 126th pitch of the night. A second-inning solo home run to Pat Winkell was the only run he gave up. Evan Voliva came in and got the final out for Agnos after he came out. “I’ve got to protect him of his health. Every decision I make is in the best interest for our program and the health of our kids,” Godwin told Hoist the Colours. 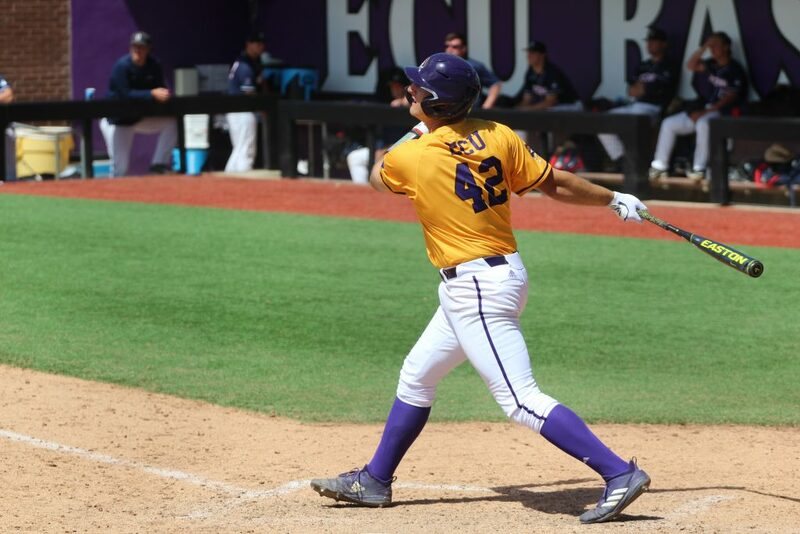 ECU’s offense totaled 12 hits as a team and scored one run in five different innings. Brady Lloyd led the way after being moved up to second in the batting order for the game. Lloyd went 3-for-5 and was 3-for-3 off of Feole. Lloyd had an RBI double in the second inning and an RBI single in the fourth inning to make it 3-1. Alec Burleson put the Pirates on the board first with an RBI single in the first. Jake Washer laid down an RBI bunt single in the seventh inning, and Packard finished off the scoring with an RBI single in the eighth inning. It was an important game in terms of the standings as well. ECU is now 9-1 in AAC play while UConn falls to 7-6. The two teams will have Friday off due to a schedule change and will play a Saturday doubleheader beginning at 9 a.m. instead.